Moms these days are all about do it yourself projects, and birthday parties are no exception. But between the food, the decorations, and the games, there are so many things to think of, so many projects to complete before the party gets started. You want your child to have a great time. You want him or her to remember this party, and you don’t want to embarrass your birthday kid with less than appealing decor. What makes all this easier on you? Having a theme to follow. But who on Earth has time to keep track of all the things kids enjoy most these days? We do! This list of 25 birthday party theme ideas for kids was created just for you, with your dream of the perfect party in mind. Make the actual board game into a life-sized version the kids can actually play! Lollipops can be made out of balloons and cellophane. Make a gingerbread man out of cardboard. Use a chocolate fountain as the swamp. You get the idea. Just use the board game as your guide and get creative. Living in a fantasy world never seemed so wonderful! Colorful tea cups, tiny cardboard rooms, games of croquet and chess, the Queen of Hearts, and crazy cat eyes make for one fantastical, memorable party. Yes, this one takes after the TV show. If your child has ever sat through an episode, you know very well how fascinated they are when watching people (1) participate in a race, (2) combine some of their favorite flavors, and (3) make it look like art. So why not do the same thing at a birthday party? Have the kids separate into teams, bake their own cupcakes with unique recipes, and see who wins! Best part? Parents can be the panel of judges! Worst part? The calorie count in eating all those cupcakes. Rainbows are all the rage with kids these days. And how much simpler could it get for you, mom and dad? Funfetti cakes, rainbow banners, multi colored balloons and streamers, colorful wigs, confetti sprinkled throughout. ROY G BIV will be your right hand guy. I challenge you to tell me one kid you’ve ever met who hates movies. Exactly, you can’t think of any. Kids love movies! Make a little popcorn, set up a blank screen in the back yard with a projector, pass around some gummy worms, sit back and relax. There is very little else needed to make this party stand out! Sand castles, sunshine, and yummy snacks make the perfect, easy DIY birthday party. You don’t even have to worry about your house getting trashed. Now isn’t that every parent’s dream? I think so. Just don’t forget the towels! Bring the dog! Bring the grill! Bring the soccer ball! With such a scenic background at your fingertips, there is very little decoration needed. Kids will have tons of space to roam while your only task is to prepare food and decorate a picnic table. Pinkies up, girls! Bring your favorite doll, a fancy dress, and your favorite tea cup. Serve simple tea time snacks like tea sandwiches, scones, and soft cheeses. Your tiny guests will love being treated like grown-ups. Superheroes or Superheroines. Princes or Princesses. The attire really doesn’t matter. All you need to do is make a few costume pieces that can be one size fits all. Use Velcro, string ties, and adjustable fabric pieces. Then watch the kids find which one fits best. Oh, and don’t forget the camera! Have kids collect wood, build their own fire (with adult supervision of course), and roast some marshmallows. They will put those Girl and Boy Scout abilities to use in the great outdoors. Be careful not to crowd them too much. They will enjoy their newfound independence, which is great news for you! Make some leis, coconut drinking cups, grass skirts, tiki torches, and colorful drink umbrellas. Set your Pandora to some cool beach tunes and watch as your backyard gets transformed into a Hawaiian paradise. Kids can use non-toxic paint to give each other washable tattoos, draw or paint pictures on canvas, create chalk art on the driveway, face paint, or even craft another cool creation. The possibilities are endless. It just depends how messy you’re willing to let it get. Set up stations that make it look like there is a fair going on in your house. Maybe include a popcorn maker, fun fair games with prizes, cotton candy and funnel cake stands. You could even make cardboard bumper cars for the kids to play in. Then, sit back and watch the laughs. Dangle plastic snakes from the ceiling, along with life-like vines. Give out tiger print masks, create green and brown accents to mimic trees, throw in a few monkeys, and don’t forget the grub! Those little jungle animals sure can eat! Googly eyes, sharp teeth, and colorful fur make for one funny party. Let the kids create their own paper bag puppet monster. You can even make some dirt pudding with gummy worms, “bloody” fruit punch, and other creepy monster food! Trains, Planes, and Trucks, Oh My! Old boxes make great cars. Save yourself some time and have kids make their own cars and even race them! Just provide the boxes, tape, paint, a checkered flag and a trophy, of course. Bust out your old ant farm. Place pipe cleaner spiders around the house, have the kids go digging for bugs in the garden with magnifying glasses, give them neat jars to collect their findings, and award the child with the coolest bug! Put up tents, give out lanterns, break out the hobo pie makers and s’more fixings. Even cook dinner over the fire. The best part? There is hardly any decoration needed other than that which the great outdoors provides! Invite Mickey Mouse, Donald Duck, Goofy, and all their friends to have a good ol’ time at your party. Play your birthday kid’s favorite Disney movie or put on Disney music with Pandora. Have kids make their own mouse ears to look like Mickey or Minnie! Have the kids come as their favorite fairytale character. Make the place look like a palace and let the kids feel like royalty in your home. Roll out the red carpet, introduce kids as their character when they enter the party, and serve them as if they were at a royal ball. Even let them create their own crowns and royal accessories. Soccer balls, baseballs, and tennis balls will surely be put to good use at this party. Let kids wear their favorite sports jersey and set up a few different games so each guest can find something they like. You can even make it into a tournament with trophies! Eye patches are just about the easiest and coolest things you could give to a kid. Have a treasure hunt right in your own back yard, complete with a treasure map. Decorate your house with pirate flags, ship memorabilia and jewels! The secret to pulling this one off? Buy a ton of candy. That’s it! 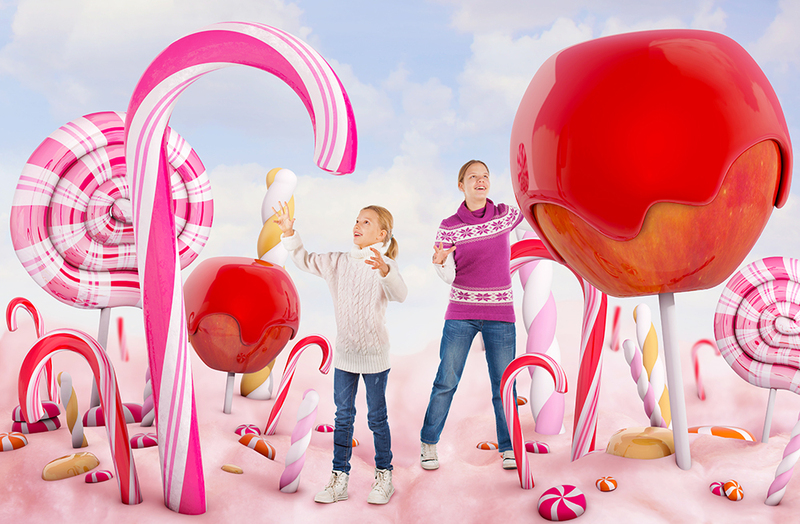 You can even make life sized crafts of candy to bring it to life. Make it fun with a golden ticket thrown in the mix, too! You don’t know how many times you’ve stepped on those darn plastic pieces, but you can put them to good use now! Have the kids create a masterpiece together. Make life-sized Lego pieces with a box, wrapping paper and plastic cups. Make a cake and use Lego pieces to finish it off! Unicorns, dragons, mermaids, and fairies are all invited! Give kids a unicorn party hat, decorate the house with dragon eggs, and have kids create tiny fairy lanterns to take home. Use edible pearl spray to make desserts look like they are mermaid treasure. This one will leave kids in awe. Besides reminding you to wrap your gifts, the only thing left to say is good luck choosing just one theme! Your child will love them all, and so will the DIY Diva in you! Looking for other kids birthday party tips? We’ve got an entire section for that. And if this all sounds overwhelming, don’t worry. We’ve got birthday party options that make every aspect of party planning easy at Pump It Up. See what we have to offer.